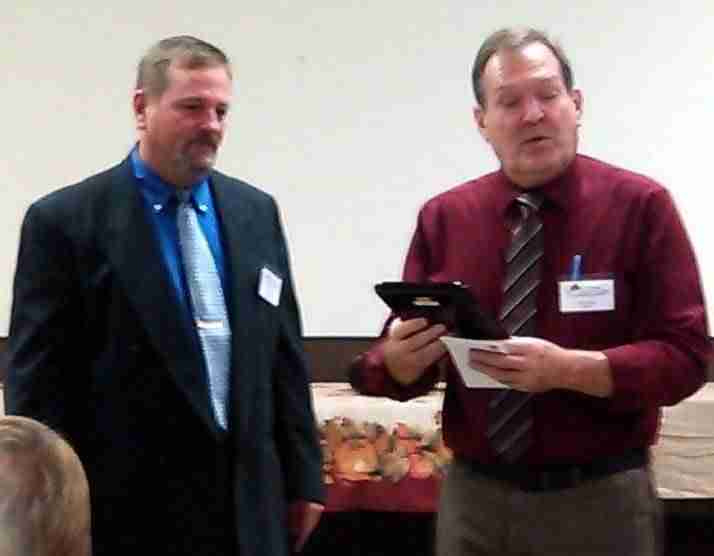 The West Unity Area Chamber of Commerce was held on November 3 with several community members in attendance to both partake in the meal as well as to honor those who would be recognized for their contributions to the community throughout the course of the evening. Those in attendance were welcomed by Cheryl Boldman and the regular meeting was called to order. After the reading of the minutes and reports from both the Secretary and the Treasurer, an invocation was delivered by West Unity Mayor Peg Bernath. Dinner, provided by MoJo’s Grab N Go with service assistance by the Girl Scouts, consisted of smoked pork, baked chicken, roasted red potatoes, green beans with bacon, tossed salad, rolls, and a lemon lush desert. In keeping with MoJo’s tradition of providing crowd pleasing meals (they were also the winner of the Chili Cook-Off during the Chamber’s Fall Festival), the meal was enjoyed by all. In Old Business, a report was given on the Auction and Fall Festival. An update was also given about the improvements made at Wabash Park by Justin Wyrick. The Chamber was able to use 2013 auction funds to assist Wyrick with his Eagle Scout Project, which included the improvements made to the park, by helping to secure the funds needed for picnic tables and benches. The Chamber also approved two amendments regarding the current Chamber By-Laws. In New Business, the Board once again approved a $75.00 donation to Michael Frybarger and the Wreaths Across America project. The project helps to lay wreaths on the graves of Veterans and has been extended to Floral Grove Cemetery. The guest speaker for the evening was Matt Davis, Executive Director of Williams County Economic Development Corporation (WEDCO). Davis spoke to those in attendance about not only his responsibilities at WEDCO but also about progress and challenges being seen in Williams County. A good portion of Davis’s speech focused on the work he has seen in Williams County communities that make Williams County the place where people want to live. It is this type of environment, one with strong communities and schools, Davis explained that ultimately aid in helping to keep established businesses thriving and new businesses at looking to Williams County as the place to start. Honorees during the banquet included Citizen of the Year Alumni from 1993 through 2014, Stanley’s Guns & Ammo (Member of the Year), and Friends of the West Unity Library (Chamber Merit Award). Separate articles detailing the works and contributions can be found on each of these honorees. Outgoing Board Members were also recognized. Marilyn Royal, Dan Woodring, and Martha Heer were each recognized for the time and efforts they contributed while serving on the Board of Directors and all will be missed. Ann Bleikamp-Spicer, Cheryl Boldman, and Pat Burkholder have generously agreed to continue to serve another two years on the Board. New faces welcomed unto the Board included Dave Cline, Colette Benner, and Angel Higgins. In the President’s Presentation, President Alan Bennett reflected on the successes the Chamber saw in 2015. Among other success, several new businesses were welcomed; the Chamber Board increased in numbers; donations were able to me made, and rides for the 2016 Gathering Days were able to be secured. Bennett, who will be stepping down from his role as Chamber President at the end of the year due to his involvement with the Williams County Fair Board and the Williams County Fair Foundation, along with his commitments to his part and full time jobs and family, reflected positively on his four years as serving as the Chamber’s President. “I am reminded of where we were and where we are headed and know it is possible and together we can. My physical presence in the Board room will never negate what I feel is my responsibility as well as the responsibility of everybody in the community – to support the local Chamber. It has been my privilege to serve the Board this year as President,” Bennett gave in his final address before handing the floor over to Larry Long for the closing of the evening. Long, both a Board member and the superintendant of Milcreek-West Unity Schools, not only thanked those in attendance but also reflected back on the years of service provided by Bennett. Long noted that it is through the efforts of people like Bennett that communities grow and succeed and, on behalf of the rest of the Board, honored Bennett with a plaque recognizing his years of service to the Chamber. The recognition was not one that Bennett expected to receive, leaving him to remark that he was both “proud and humbled to be able to serve the community”. The next meeting of the West Unity Area Chamber of Commerce Board of Directors will be held on December 7th at 7:00 PM at the library. A new Chamber President will be elected that night. © 2015 – 2016, Chelsie Firestone. All rights reserved. Be the first to comment on "West Unity Area Chamber Honors Many During Annual Banquet"